Pilsner Urquell is a beer of both historical and personal significance. I’m not sure if my weakness for free stuff instigated my fervent obsession with beer, or was merely the catalyst that set it in motion. Either way, I was a captive market after just one look at the elegant stemmed vessel in the liquor store flyer. 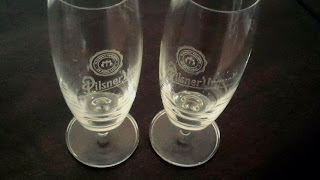 Even after the addition of 70 subsequent glasses to my collection, this style has remained my favourite. Pilsner Urquell is indeed the first of its kind, created in the Czech town of Plzensky Prazdroj. This town was once a part of the Austrian empire, and the name is translated from german to “Pilsner from the original source”. Josef Groll is thought to be the first to use a bottom-fermenting strain of yeast in 1842. Legend has it this particular strain of yeast was smuggled out of a monastery and given to Groll by a fugitive monk. The resulting brew was a clear golden hue - a stark contrast to the more prevalent cloudy top-fermenting beers. The local ingredients - pale Moravian malt and Saaz hops, generate a clear, dry lager with medium body and a distinct bitter finish. 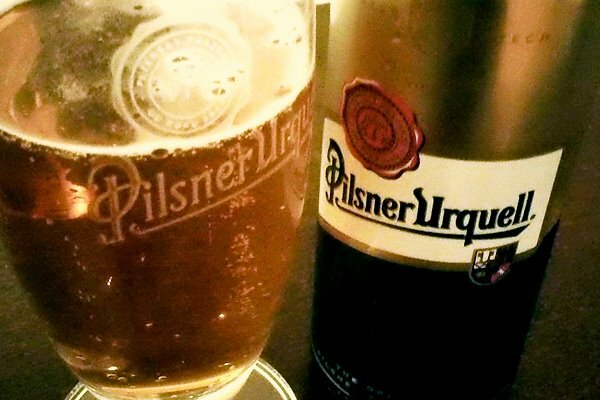 This flavour profile makes pilsner a versatile style for pairing with food. The crisp pale malt does not overpower the delicate flavours of fish and seafood, while the refreshing hops can cut through rich fried foods. Think fish n’ chips, seared scallops, and – you guessed it, pizza. Making pizza dough from scratch is a lot less work than it seems. The dough takes no time to mix up, and you can leave the dough to rise for several hours. Let the yeast do their business while you do yours. Hint: If, like me, you exist in a realm of perpetual winter, your kitchen may be too cold for the yeast to ferment. You can turn your oven into a cosy little sauna by heating it to 200-250°F. Put the bowl of dough into the oven, shut the door, and turn the oven off. Just don’t forget it’s in there. Italian deli pizza with Capicolli, cremini mushrooms, and sundried tomatoes. 1. In a large mixing bowl, combine flour, semolina, sugar, yeast, and salt. 2. Gradually pour in beer and olive oil, mixing to form a dough. 3. Turn dough out onto floured surface and knead until smooth and elastic. 4. Form dough into a ball and place in a large, oiled bowl. 5. Cover bowl with a damp cloth and let rise until doubled in bulk. This will take about 1-1½ hours. 6. Punch dough down and let rise again, another hour or so. 8. Sprinkle cornmeal over the bottom of two round baking sheets to prevent sticking. 9. Divide dough in half and shape each into a 10-12” round. 10. 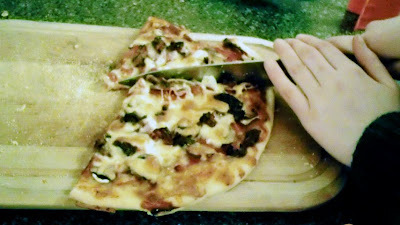 Stretch dough over baking sheet or transfer to pizza stone. 11. Add toppings and bake for 15-20 minutes. You can add whatever toppings you want. I’m an over-achiever, so I made three kinds. Thai Chicken: Peanut sauce, chicken, red pepper, mango, green onion, mozzarella, and sesame seeds. Barbecue Chicken: Barbecue sauce, caramelized onions, red pepper, chicken, and white cheddar. Italian Deli: Tomato sauce, Capicolli, Cremini mushrooms, sundried tomatoes, and mozzarella. Special thanks to guest photographer Eryn Thorsley. All volunteers for this blog are compensated accordingly with food and/or beer. Kenning, D. (2009) Beers of the World: Over 350 Classic Beers, Lagers, Ales, and Porters.